In this Celebrity Snapshot, we look at the astrology components in the chart of Aquarius Oprah Winfrey. At her moment of birth, Oprah was given four planets in Air signs and five planets in fixed signs. Notably, many people were born with these astrological opportunities, but it was Oprah who had the will and determination to use these gifts to become one of the truly original communicators of our time. She did it all by expressing the humanitarian ideals of Aquarius, and by making her audience part of a greater social consciousness. In Oprah, we see the Aquarius mental process—which works like an “electronic capacitor”. The electricity is stored “on hold”. When it reaches its programmed threshold, the acquired data is released in spurts of electrical discharges. You can see the process in a nanosecond freeze-frame of time, when Oprah’s entire body seems to go on hold. The eyes appear to look more inward than outward, the fingers lock to become rigid “antennas”, and the breath seizes with a deep gasp. (This draws the mouth tightly down, exposes the lower gum and creates a facial expression which reflects awe and surprise). Naturally, Oprah’s Aquarius personality is altered by the other components in her chart. With her Moon in Sagittarius—there is a noticeable jump in Oprah’s enthusiasm, as her expansive emotions ignite the fire in her sparkling Aquarius eyes. Watch how her spirit soars, as she responds to others with her exuberant reactions. “Wow.” ”Amazing.” “That’s wonderful!” In addition, when these Archer arrows are ignited, her physical energy heightens, as their gestures become animated and scattered. At times, she becomes overly excited, and noticeably clumsy. As you look at these Celebrity Snapshots, you will find several with Centaur components. All of them will express the mutable fire of this sign in some layer of their personality. However, Oprah is the only one who combines the spirit of the Centaur with an eternally hopeful Aquarius Sun. She is a unique and free spirited soul, who place few judgments on others. It’s no wonder she’s everybody’s friend! 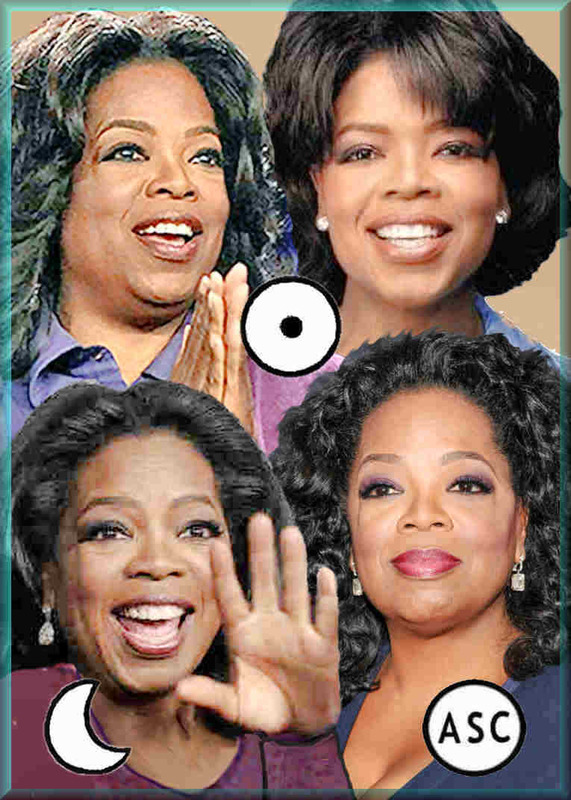 In 1999’s Celebrity Snapshot column in DELL HOROSCOPE MAGAZINE, data was given that gave Oprah a Virgo Ascendant. Why not? She was always meticulously quaffed and conservatively dressed—not what you’d expect in an Aquarius personality. Since many of her shows examined self-help, service and health issues, we accepted that she had a Virgo Ascendant. New data claims says differently. It even lists a different town. Oprah’s new birth time is now stated to be 4:30 A.M., not even close to the 7:58 P.M. time given previously. This shows the problem of getting correct birth times. Furthermore, this author believes that the new time is also slightly off, since it is a “rounded figure”. The 4:30 a.m. time gives her 29 degrees + 41 minutes of Sagittarius Rising. Add just nineteen minutes more, and she would become a Earth sign rising again—but this time, her Ascendant would be in Capricorn! With a known Centaur Moon and a possible Sagittarius Rising, the fires of mutability would be obvious. However, on our first impression of Oprah, we often see a conservatively dressed individual— in dark-colored and black dresses (rather than bright red-hued, orange or yellow ones). Also look at her facial structure. It lacks the long neck and large jaw of the horse. What we see are her wide-set eyes, resting deeply under the bushy brows. There’s also the high- set cheekbones and recessed chin. These are traits often seen in a goat. With this Capricorn mask, Oprah’s Aquarius personality often casts a commanding “sense of duty”. With this window to the world, Oprah truly believes that “all things are doable”. What else would give her the tenacity and drive—to built such a powerful empire? All of this suggests that Oprah’s Ascendant is Capricorn, rather than that of a galloping Centaur.